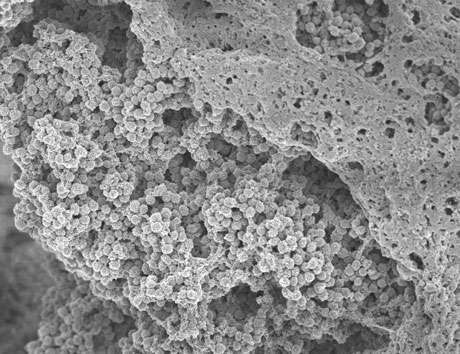 Biofilms frequently coat the surfaces of catheters, and of various medical implants and prostheses, where they can cause life-threatening infections. New research at the Sahlgrenska Academy show that coating implants with a certain "activator" can prevent Staphylococcus aureus, the leading cause of hospital-acquired infections, from forming biofilms. Antibiotics are impotent against biofilms. Now Gothenburg researchers Jakub Kwiecinski, Tao Jin and collaborators show that coating implants with "tissue plasminogen activator" can prevent Staphylococcus aureus, the leading cause of hospital-acquired infections, from forming biofilms. "We hypothesized that if we forced the human body to start dissolving those clots, we could prevent the biofilm from developing," said Kwiecinski, a post-doctoral researcher in Jin's laboratory. "This deprives S. aureus of a scaffold for biofilm formation and prevents infection," said Kwiecinski. After performing the research under laboratory conditions, they confirmed that it works by coating catheters that they then implanted into laboratory mice.